Nine Indiana University scholars and researchers have been promoted to distinguished professor, the highest academic rank the university bestows upon faculty. 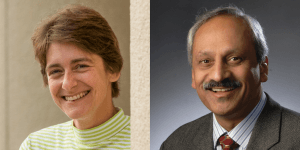 The nine new distinguished professors include Indiana CTSI director Anantha Shekhar, MD, PhD, a neuroscientist and medical researcher in the IU School of Medicine, and Tatiana Foroud, PhD, scientific director of the Indiana Biobank and a statistical geneticist in the IU School of Medicine Department of Medical and Molecular Genetics. The distinguished professorship recognizes faculty who have transformed their fields of study and have earned international recognition. Faculty, alumni, professional colleagues and students nominate the field of candidates based on outstanding research, scholarship, and artistic or literary distinction. Nominations are reviewed by the University Distinguished Ranks Committee, which recommends appointments. Indiana University Center for Health Innovation and Implementation Science Chief Operating Officer Nadia Nguyen Adams, MHA, is working to empower doctors, nurses and other clinicians to provide quality, affordable care to millions of patients in Indiana, Illinois, Kentucky, Michigan, Ohio and beyond. In recognition of her efforts, Adams was recently named to the Indianapolis Business Journal’s list of “Forty Under 40,” which honors Central Indiana residents who have become leaders in their fields before reaching age 40. Indiana CTSI’s Community Health Partnerships (CHeP) has awarded pilot grants to eight partnership projects between local community groups and researchers at Indiana University, Purdue University and the University of Notre Dame that focus on improving health and health care in diverse communities across the state. The awards were announced in October 2016. Purdue University’s Bioinformatics Core was recently awarded Indiana CTSI core designation. The vision of the Bioinformatics Core is to facilitate, amplify and accelerate biological research and discovery through provision of high-quality bioinformatics analysis in a timely and economical manner. The core provides consultation and advice on project design and development, as well as training through workshops and seminars. Their services include a full line of Next Generation sequencing analyses including integration of other “-omics” data. If you have any questions, contact Jyothi Thimmapuram at jyothit@purdue.edu. You can also subscribe to the Bioinformatics Core’s email list. Investigator-initiated and industry-sponsored clinical research rates can now be accessed through the IU Clinical Trials Office’s (CTO) website. Simply login with your CAS credentials to view or download the document. Beginning July 1, 2017, the Indiana CTSI’s Clinical Research Center (CRC) will be charging for all studies, including investigator-initiated studies. In addition, the start-up rate for industry-sponsored studies has been updated. Please visit the CTO website to access the new rates. With the CRC charging for all studies beginning July 1, please keep in mind that for pilot studies, there is a support mechanism offered through the Indiana CTSI’s Translational Development Teams (TDTs), which provide investigators access to experts who can help implement high-quality pilot projects that generate successful external grant submissions. The TDTs also offer pilot grant funding to support development of these projects. Please contact Lane Coffee at rlcoffee@iu.edu or Julie Driscol at judrisco@iu.edu for assistance. You can visit the Indiana CTSI’s website for additional funding opportunities. Is your team seeking to reach new audiences and broaden its community profile through research? Would you like help with recruiting participants across multiple stakeholder networks? HANDS in Autism may be able to help. The HANDS in Autism Interdisciplinary Training & Resource Center, as part of the Indiana University School of Medicine Department of Psychiatry, is pleased to offer a number of services relevant to the research missions of investigators through the HANDS Core. These services include assistance in recruitment, behavioral and/or educational assessment, and program evaluation efforts targeted to a range of community stakeholders. HANDS provides service and consultation to a number of state and local stakeholder networks to address the behavioral, educational and vocational needs of individuals across a broad range of ages, functioning levels and disabilities. Service and consultation efforts range from direct service, training and coaching to program and research design and implementation. Through this integration and involvement, the HANDS Core can help other groups broaden their community and research profiles and involvements to extend across participant groups inclusive of educational personnel, health care providers, community-based caregivers, families and other community members. In addition to the HANDS team’s presence within a number of these stakeholder networks throughout Indiana, HANDS in Autism also facilitates eight Local Community Cadres (composed of local school and medical personnel, family members and other community interest groups) designed to increase the dissemination and engagement at the regional and community levels across the state in building local capacity. HANDS is further routinely contracted across several state agencies to identify and directly address service needs while facilitating and/or guiding community engagement around identified gaps in services. One example of this is the facilitation of survey research relating to the service delivery needs within the autism spectrum disorder (ASD) community. Within this example, our current survey reach is comprised of nearly 1,500 responses spanning family members, individuals with ASD, medical providers, educators, justice personnel and other community providers, illustrating the HANDS Core’s ability to reach an extensive audience for mixed methods data collection purposes. If you would like to learn more about how the HANDS Core can assist your team’s research and community efforts, please contact 317-274-2675 or HANDS@iupui.edu. If you haven’t already, please take a look around the Indiana CTSI’s newly redesigned website at IndianaCTSI.org. We are working to migrate the Specimen Storage Facility Store, Grants Management and Funding, and the Clinical Trials Listing to the new framework. In the meantime, follow these instructions to create new log-in credentials for the legacy website. The Indiana CTSI also has a new logo, which all units and programs are required to use in their communications and marketing materials. Please visit our website to download the Indiana CTSI logo and other branded templates.